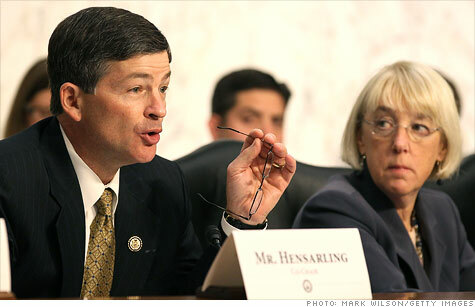 Republican Jeb Hensarling and Democrat Patty Murray, the debt committee co-chairs, each say their respecitve sides of the aisle need to see more give from the other party before they can agree. NEW YORK (CNNMoney) -- With just days left for the bipartisan debt committee to agree to a deal or call it quits, the mood is pessimistic. The differences that divide the committee are the same issues that divide the whole Congress: How best to curb spending on entitlements and raise more tax revenue. Republicans and Democrats both say they have offered proposals that demonstrate serious compromise on key points. But the response from the other side of the aisle is, essentially, "not enough." While the panel's deadline for a final vote is Wednesday, any plan must be made available 48 hours in advance of a committee vote and must be accompanied by a Congressional Budget Office analysis scoring how much it would reduce deficits. There may be a way around the procedural rules, but as of now, the committee will have to produce a scored proposal by Monday if it intends to vote on anything by Wednesday. Here's a rundown of what happens if the committee reaches a deal; fails to reach a deal; or manages only to agree to a partial deal. Deal: To stave off automatic spending cuts known as a sequester, the super committee must propose ways to reduce deficits by at least $1.2 trillion over 10 years. At least 7 of its 12 members must approve a plan in order to send it to the House and Senate in the form of legislation. Then, both chambers must vote on the bill without amendment by Dec. 23. For the plan to pass, a simple majority in each chamber must vote in favor. If both chambers approve the deal, the next stop will be the White House for President Obama's signature. If he signs it, the plan becomes law. No deal: Of course, the super committee could just collapse under the weight of unyielding partisanship and vote down any potential deficit reduction plan. Or even if it votes one through, Congress could vote it down or the president could veto it. In any of those cases, Congress will face the threat of $1.2 trillion in automatic cuts in defense and non-defense spending starting in 2013. Those cuts would be evenly divided between the two categories and would exempt Social Security and programs for low-income people, such as Medicaid. It would also limit cuts to Medicare. At least that's how it's supposed to happen. But since Congress made the law governing the sequester, it can also amend or repeal it, as some lawmakers are pushing for. Or, much less likely, lawmakers can use the 12 months before the sequester kicks in to pass their own deficit reduction measures to avoid automatic cuts. Partial deal: What if the super committee splits the baby and approves a plan to reduce deficits by less than $1.2 trillion? If such a plan is enacted, the sequester would make up for the difference between what the super committee proposed and $1.2 trillion. So if the committee settles on $600 billion, another $600 billion of automatic spending cuts would take effect in 2013, unless Congress changes the law. There's another partial-deal scenario: The super committee agrees on some cuts but directs Congress to come up with the rest by a certain date. For instance, it could mandate that Congress enact tax reform that raises a certain amount of revenue for deficit reduction. Those deficit savings won't help avert the automatic cuts, however, unless they are enacted before the sequester hits in 2013, said Sarah Binder, a senior fellow in governance studies at the Brookings Institution.